Flat honing, also called fine grinding, high-speed lapping or high-precision grinding is an abrasive process that combines speed and accuracy to great effect. As can be seen in the picture to the right, the layout of a flat honing machine is almost identical to that of a lapping machine. But unlike a lapper which uses free abrasive media, a flat honing machine uses opposed grinding wheels. Flat honing can be used to create highly accurate flatnesses on two sides of a workpiece simultaneously. The process is vibrationless and very rigid. In addition to increasing speed, removing stock from both sides simultaneously also removes any internal stresses within the part such as bowing. Finally, abrasion happens 10-20 times faster than traditional lapping. For answers to your questions or more information on flat honing and fine grinding machines call Liberty at 847-276-2761 or send us an email sales@libertymachinery.com. Liberty Machinery buys and sells all types of flat honing machines. We are your trusted source for high quality lappers, hones, and other used equipment. 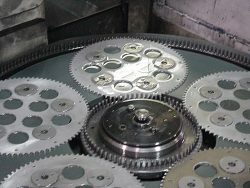 A flat honing machine consists of grinding wheels, workholding plates, pin rings, the cylinder that lowers the top wheel, and the motor and accompanying apparatus. The super abrasive wheels sit on either side of the workpieces, usually made with diamond or cubic boron nitride. Each piece is held within a workholding plate. Once all the parts are loaded, the cylinder lowers the top wheel into direct contact with the workpieces at the desired thickness. As the bottom wheel and top wheel rotate independently, the workholding plates also spin along the inner and outer pins like a spirograph, creating a very even application. Flat honing can be used on most materials, from hard to soft. Components of most sizes and shapes can be quickly and easily processed, including rings, seals, heat sinks, gears, bearings, rollers, slitter knives, cutting tools and others. These components are used in a variety of devices including precision pistons, automotive sensors, valves, gear pumps, rotary pumps, faucets, computers, telecommunication devices, and virtually any product with a sealing surface. Liberty is always looking for used flat honing and fine grinding machines to buy for inventory. Contact us and let us know what you have for sale. We’ll be happy to give you a free quote. See our used Flat Honing and Fine Grinding Machines for sale. Brown, James. Modern Manufacturing Processes. "Grinding out bottlenecks," Productive Times .